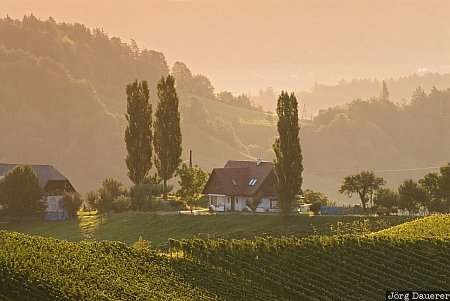 A farmhouse in the vineyards near Gamlitz in front of rolling hills. Gamlitz is in the south of the state (Bundesland) Styria (Steiermark) in Austria. This photo was taken in the morning of a sunny day in August of 2007. This photo was taken with a digital camera.